I have to say still not sure about this climate change thing but sure as hell something is going on, in the over 10 years of doing Fishing Holidays in the Florida Keys the weather has sure changed. Not sure if it is not rose tinted glasses or just turning over 60 but I cant remember swings like this take the poor Keatings week. Strong winds nearly ever day and a record low 45 on their last day then in just 3 days and 2 days since they have gone a near record high 81 that’s a 36 degree swing. Yesterday the problem was no wind yes no wind and fog the bay was covered in a dense fog all day and the fog advisory is still in effect this morning just how crazy is that. 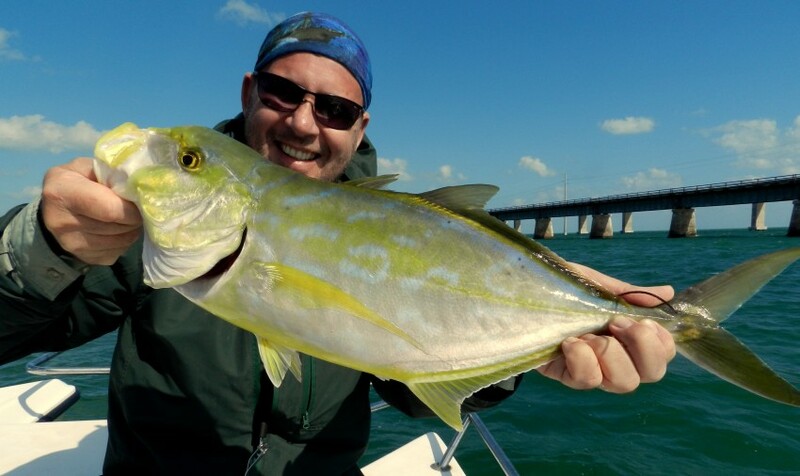 Back to Alan’s week I have to give the guys 11 out of 10 for effort boy did they stick to their task and the good old Florida Keys gave them some fish to smile about. 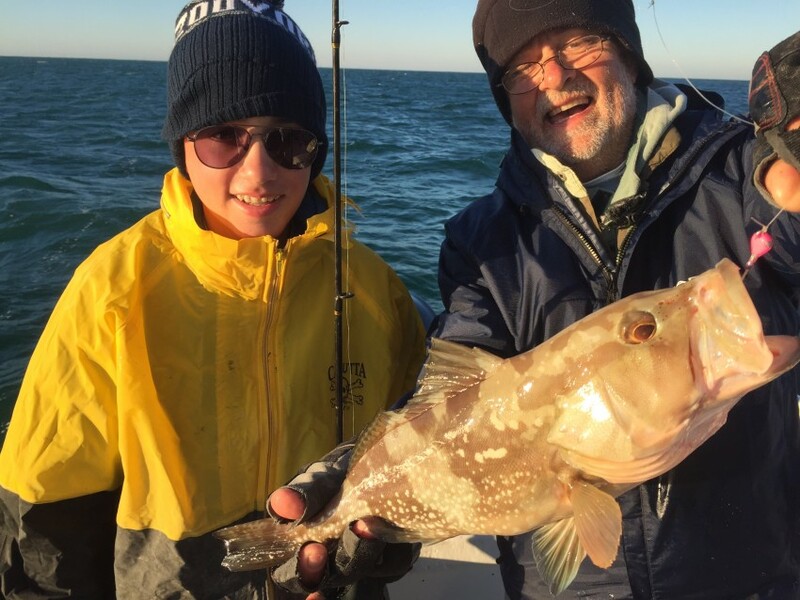 With out a doubt Alan’s biggest smile was just fishing with his son who I think surprised us all and I think is going to make one hell of a fisherman. 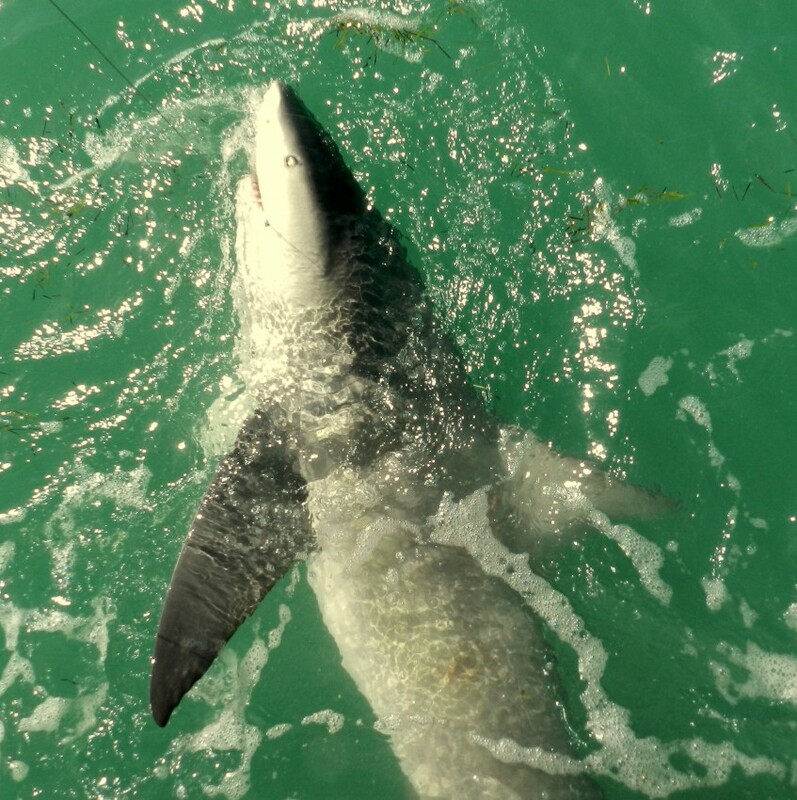 Still no news on our tagged shark the boffins have also had bad weather on their latest tagging mission but have to be back at the lab on the 27 th so will more than likely have all the details on the nest blog. 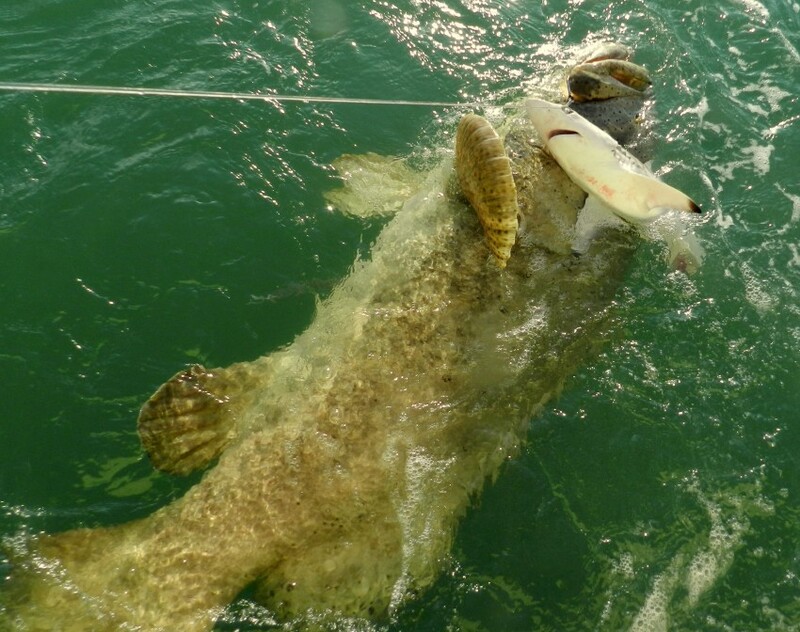 So to sum up Alan’s week tough conditions but we caught fish ever day did not get where we wanted best fish of the week Alan’s near 400 lb grouper just showing what you can do even when it is not perfect. There is a lot going on in the angling press over here at the moment with projects to get children fishing and loads of adverts saying ” Fish boxes not X boxes ” and I must say one of my personal highs from last week was watching young Harry Keating fishing. 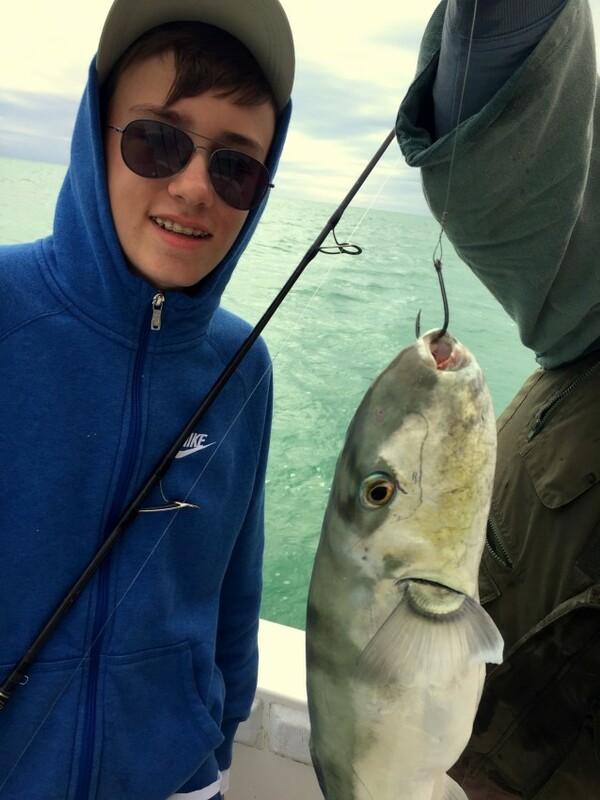 At just 15 he did a fantastic job on some very large fish and just loved his shark but was just as happy with all the small stuff as I have said before once you lose the enjoyment of small fish you have lost a lot. The weather gods were far from kind and on their last day they all had to take a record Febuary low at just 45 degrees with a 20 + mph wind and the boat doing nearly 30 mph god knows what the wind chill was but we still found feeding fish. So with a hammerhead shark under his belt and some cracking fish I feel safe to say Harry has caught the dreaded Keysitis which can only be cured by regular Fishing Holidays in the Florida Keys what a shame. 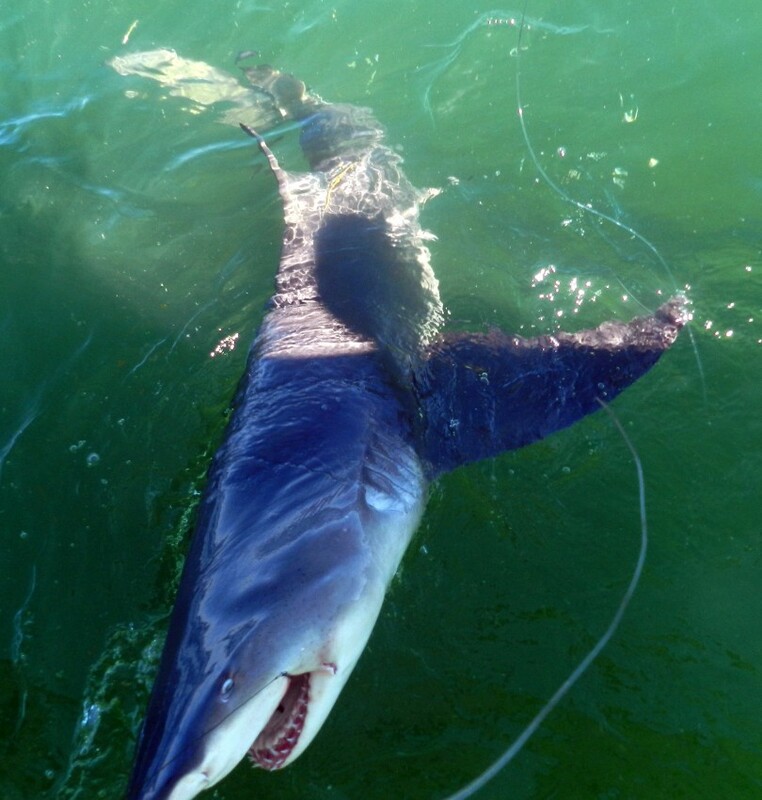 No update on last weeks tagged shark the boffins are off all week tagging sawfish what a dream job but I have some one to talk to Monday so I will post next week all the info on that 7 ft 6 in lemon shark. 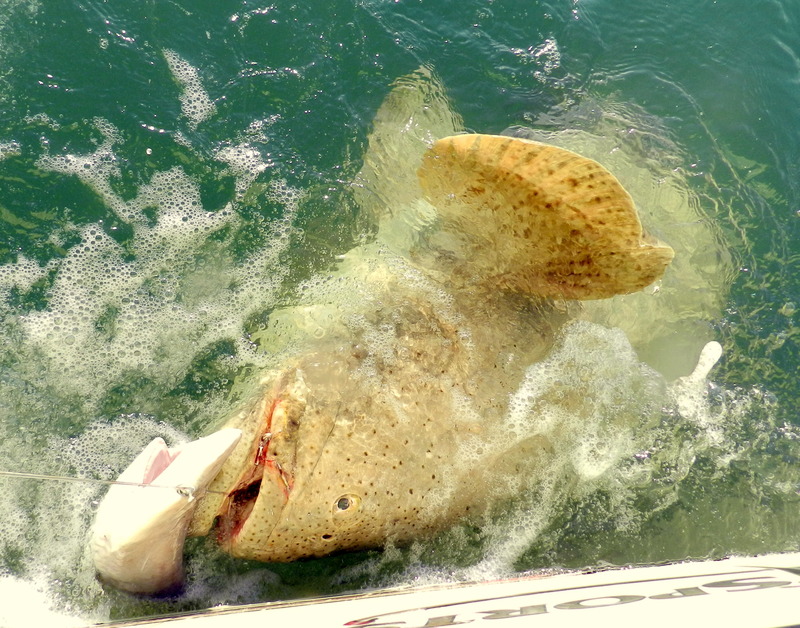 Also if we can work out a way the most amazing video of the fish of the week a near 400 lb goliath grouper that had Alan making some very strange noises. 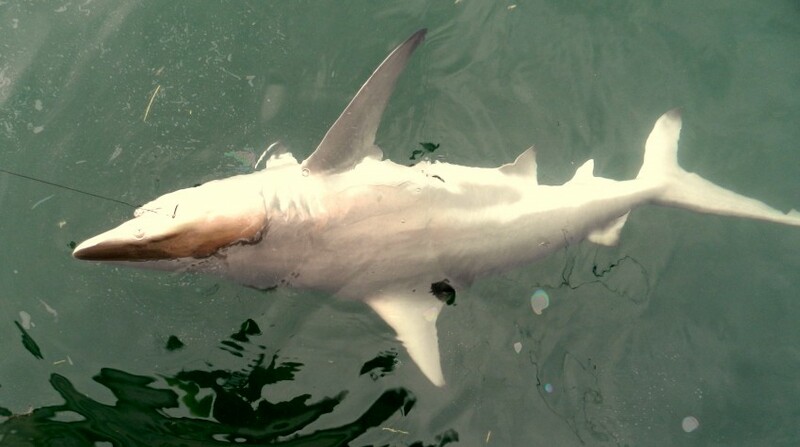 It was the trick again of using a small shark as bait I know some people are not happy about me doing this but it is legal and most times we even can use the bait again and if you fish over here small shark are not what you would call thin on the ground. A nice selection of Harry’s pics from last week and I hope to see him again very soon. 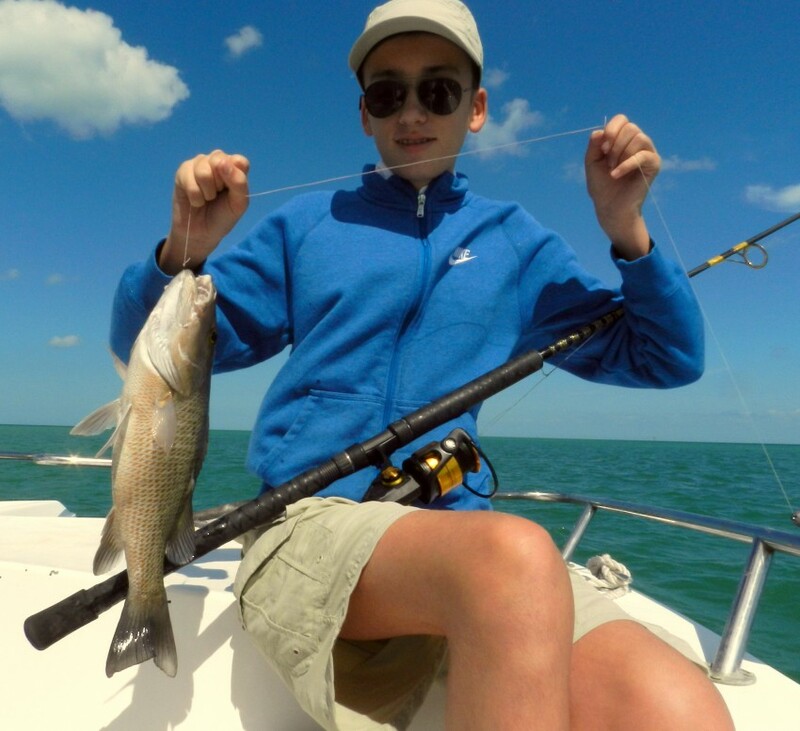 You know you have been doing something a long time when guests who first came on a Fishing Holiday in the Florida Keys start to bring their children to share the fun of the Keys. 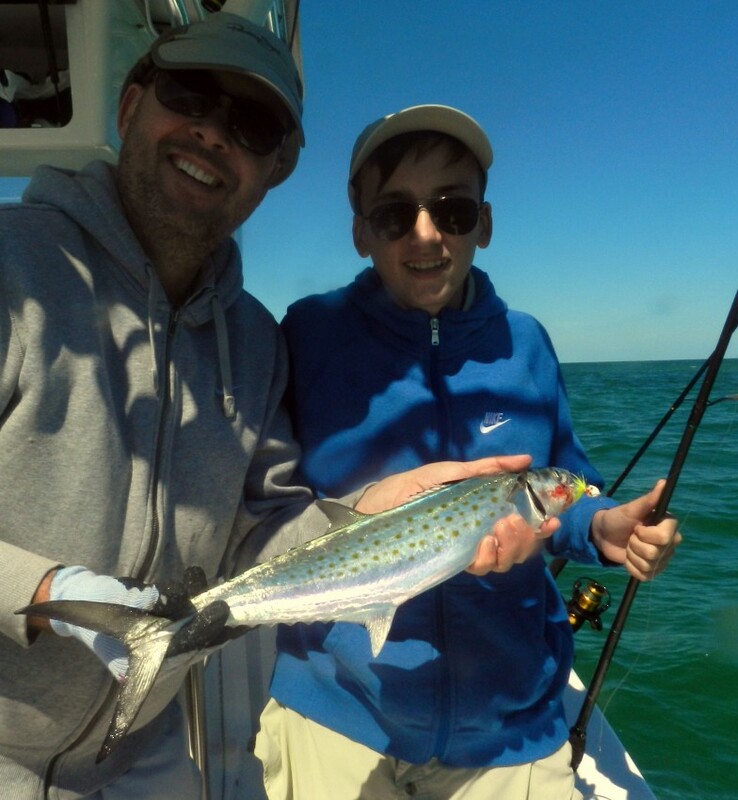 This weeks anglers are Alan and Tim Keating and Alan who brought his son Harry who at 15 seems to be how they say ” a chip off the block ” and already showing some very good angling skills. 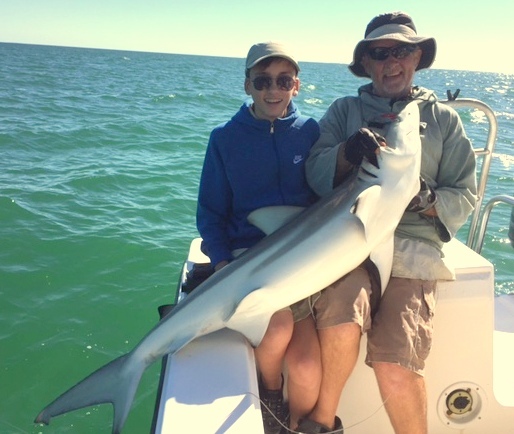 His first big fish was a way to cool hamerhead shark we were all very excited but Harry just took it in his stride OK it was at about 90 lbs not a monster but one ticked off the list and some guys take many years to get a hammerhead. 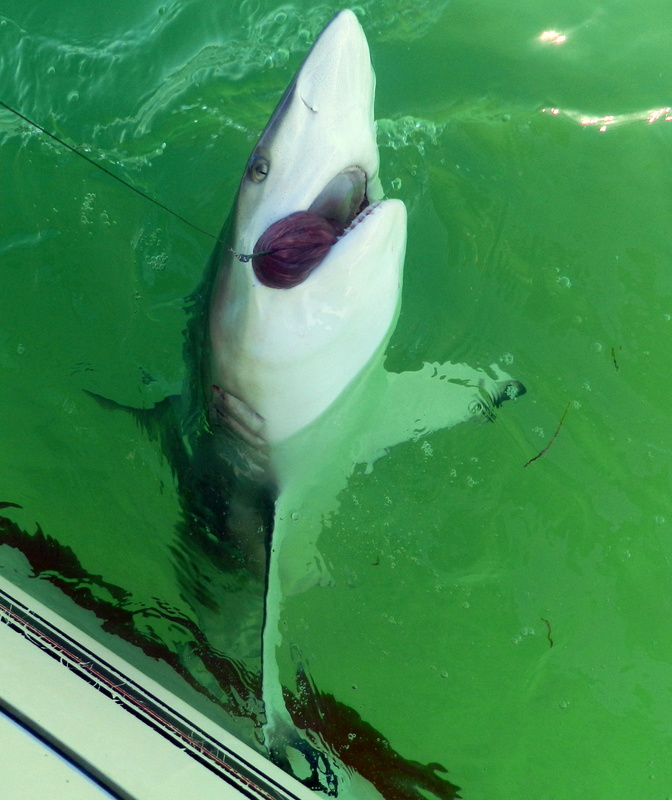 An other title for this blog could have been a very sharky day despite water temps now down to just 61 due to our long windy cold spell the shark were just on fire. 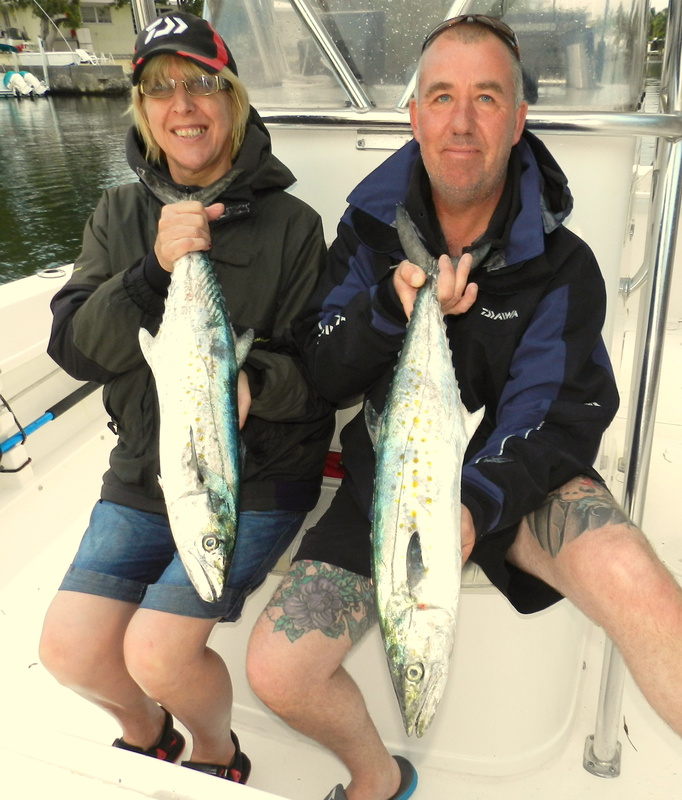 With the mackerel still being all over the place and some very nice ones the best bait is just a chuck away and with so many macs you can put a fresh bait down ever time. 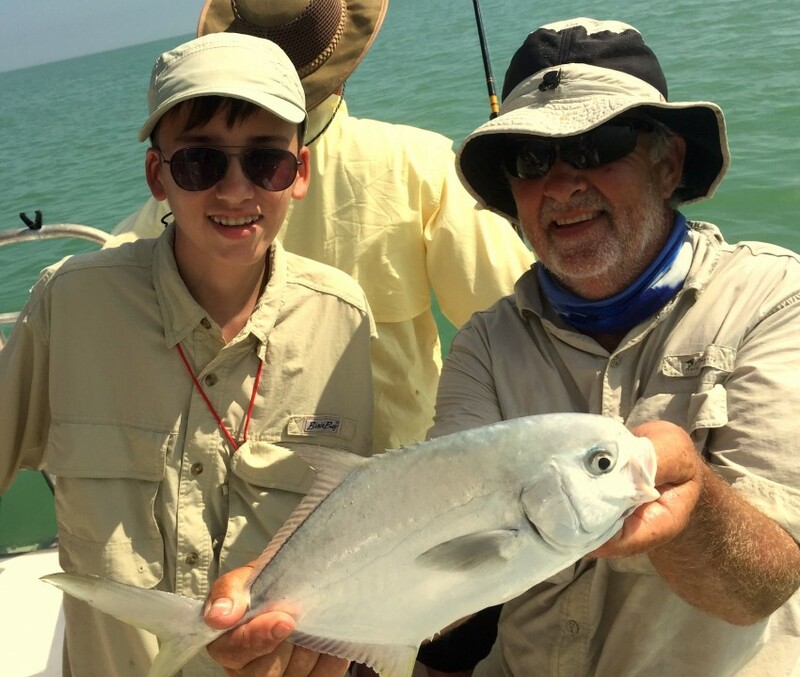 Well on the first day we nearly had the shark grand slam but with hammerhead, lemon, blacktip, spinner, blacknose, sharknose shark but we still had a full on shark day and fish of the day had to go to Tim. Now often is the case big fish will eat small baits not sure why but I think it is because they can and Tim found himself stuck to a very big fish on a very small rod. 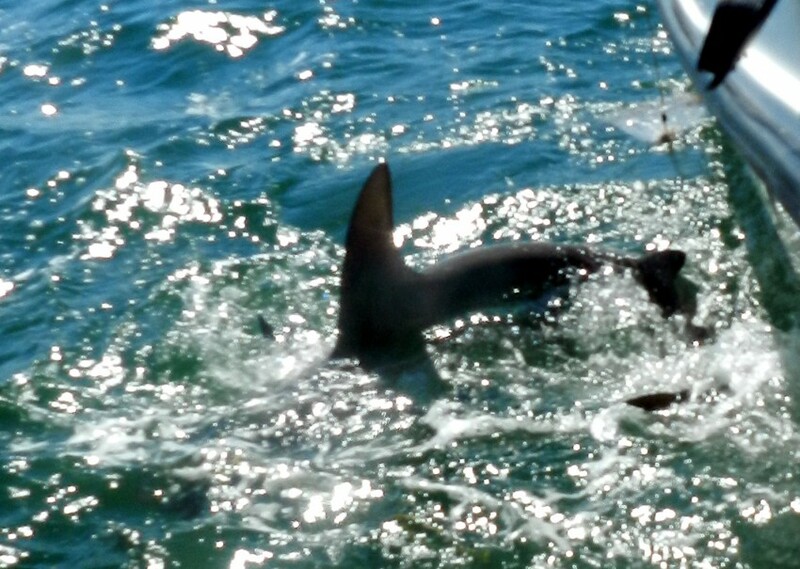 He was after what we call sporty shark on a 30 lb rod when a lemon well over 100 lbs came to join the party but after what seemed like an age Tim had the fish to the boat but after a few pics and a short video it was off to join its friends again. 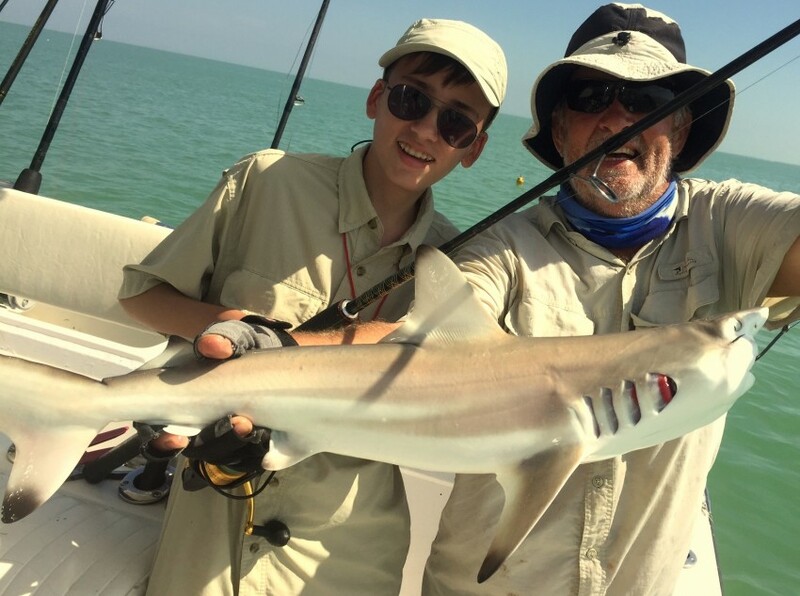 Alan’s special day with his son Harry was also a special day for fish the dream we had our first tagged lemon shark if you look at the close up photo you will see the yellow tag. 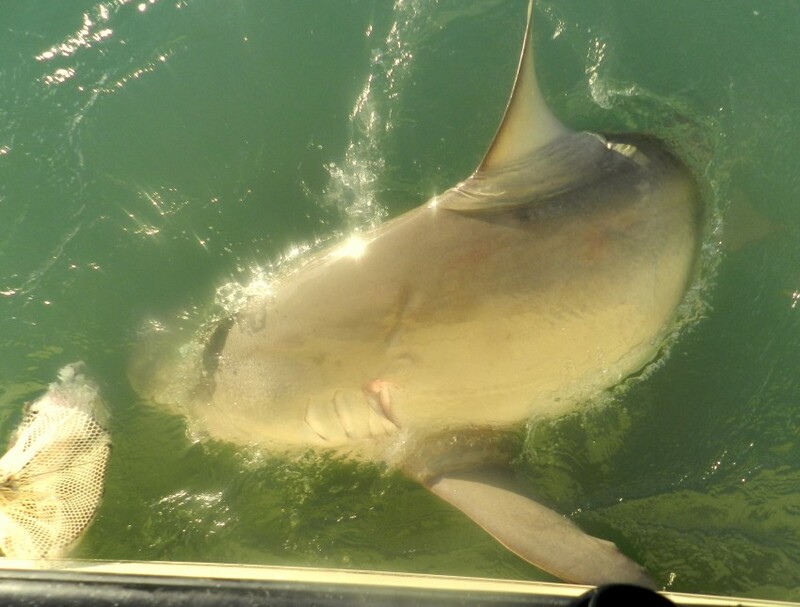 Yesterday was a holiday in the US but later on today we will be phoning and claiming our prize and finding out where and when this 7 ft 6 in lemon shark was first tagged very cool indeed. 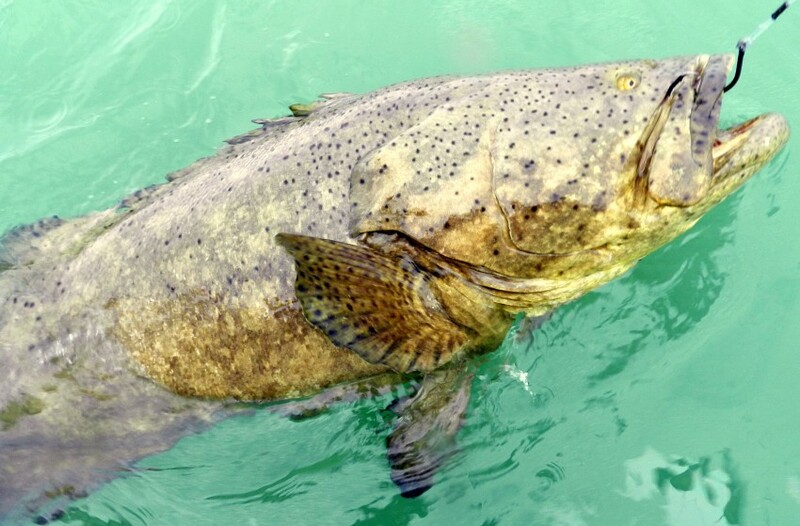 The sad thing about a Fishing Holiday in the Florida Keys it always seems to come to an end way to quick and when you are fishing with friends as I hope I can call Paul and Carol it is even worse. The weather gods were not on our side for the last day either a very cold ( for us 65 night ) and strong winds had left the seas in a mess and even all of the bay was a no go so off to the mangroves was the plan A . A few small fish but after the fun we had at 7 mile bridge it was the next move to see if their were any more shark on the go and there is always lots to catch to keep the rods on the go. Again lots of small stuff but the shark were a no show and the water for sharking just way to weedy and you all know the saying ” they dont do salad ” just one small piece of weed on a shark bait and it is game over. 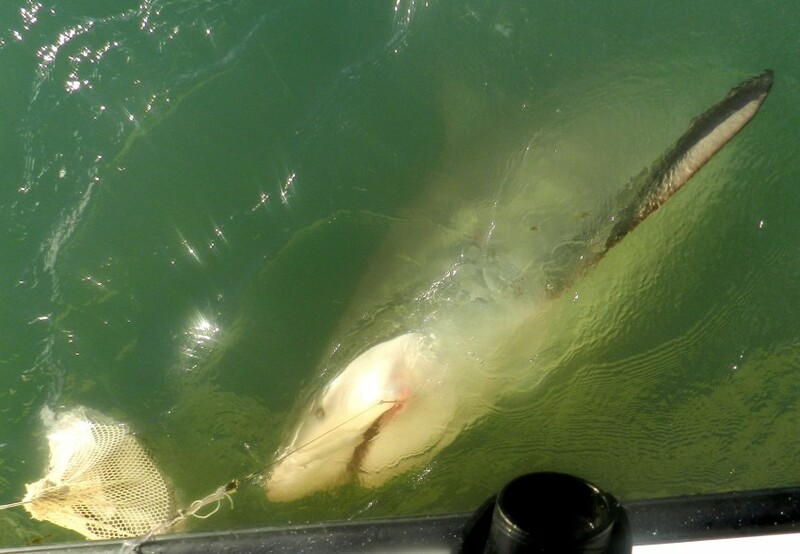 So with just over an hour left of their last day I had as Baldrick used to say come up with a cunning plan and a week ago I had been told a huge bull shark was seen of the dock in Vaca Cut so as it was on the way home worth one last try. 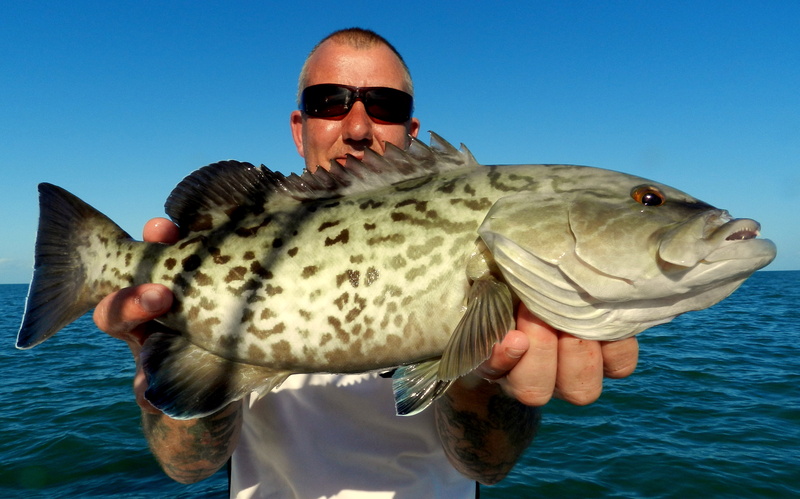 When we got there no much tide and we had fish messing with the baits but no bulls after half an hour we had a better run and had to follow but it turn out to be a nurse of about 80 lbs so back we went. Now the tide was pulling and first run down a storming take then FISH and I mean serious fish on. 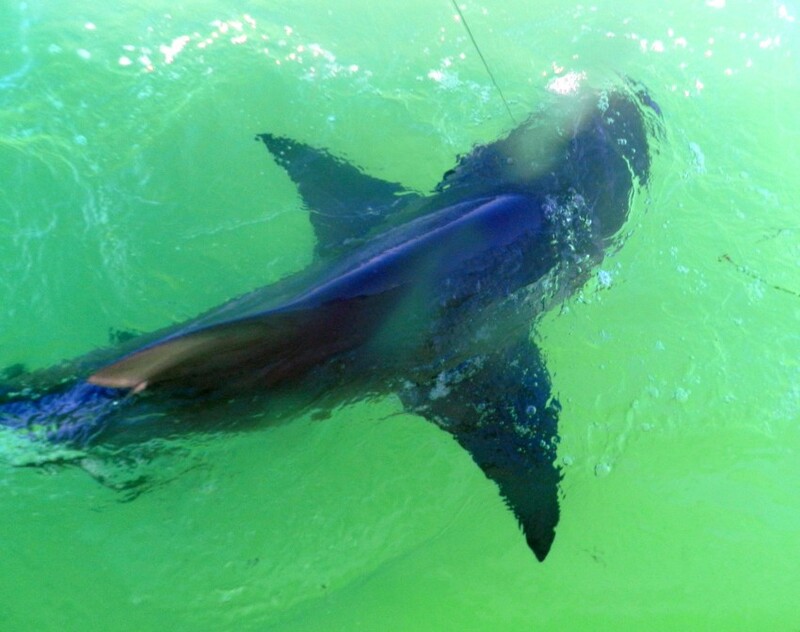 Well by the runs and the power this was on massive shark one of the famous Vaca bulls was truly connect to Paul who is one strong man but the fish was the one in control taking my boat all over the place all we could do was hang on. After an hour we had to wind up the drag and the fish was going to take us after near a mile into some nasty water so Paul said wind up the drag ans lets give it some. 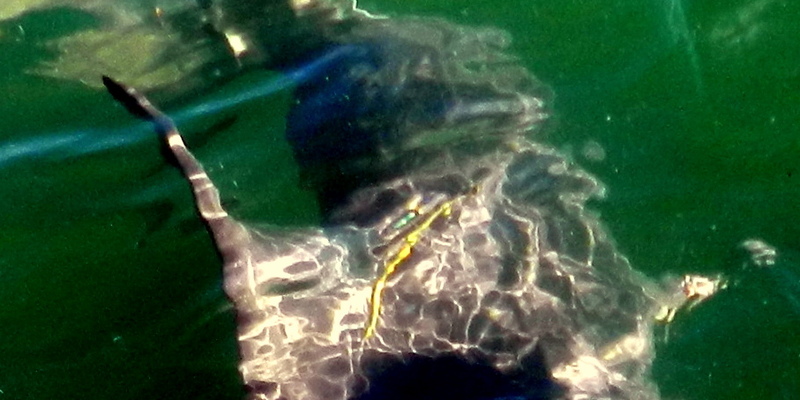 At last I managed to grab the leader and it was like I was attached to car just no give then we all saw it WOW OMG this puppy was near 10 ft and way over 500 lbs and so fat I have never seen such a girth on a shark before. High fives all round only bummer we were all so amazed by the fish no pics then the extra strong hook straighten so back to see if we could get an other one for Carol. With in seconds it was fish on for Carol and a second huge bull was pulling Carol and my boat all over the place but this fish had no chance with Carol and was soon to the boat and some very cool pics not as big as Paul’s but at over 8 ft a solid 400 lbs. So we end the week with two PB’s and two very happy campers pics, from the week and the pics of the SMALLER BULL still cant get my head round what happened. 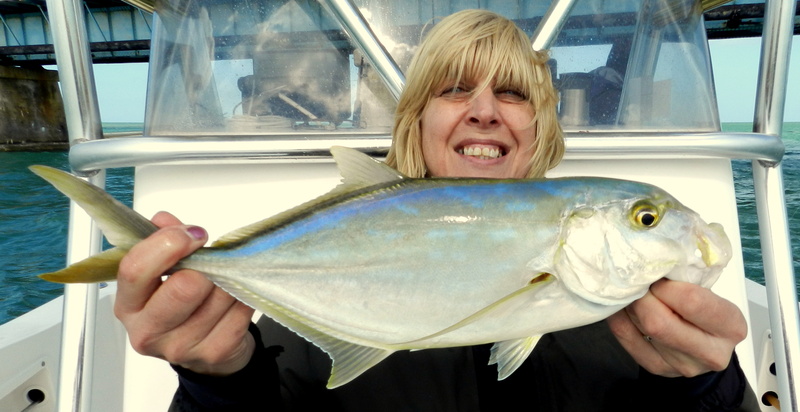 Not sure what it is the pheromones or the Miss Ballantine effect ( the record salmon lady ) or just because she loves fishing but every time Carol comes on a Fishing Holiday in the Florida Keys she just does so well. Carol who came to fishing late in life after meeting Paul took to it way better than a duck to water as they say. I even asked Paul about it and even he said it is amazing and when she beats him in a match in the UK he is nothing but proud for her and rightly so. The other day she did something that even left me speechless and a fishing story that even a seasoned pro would find hard to make up. 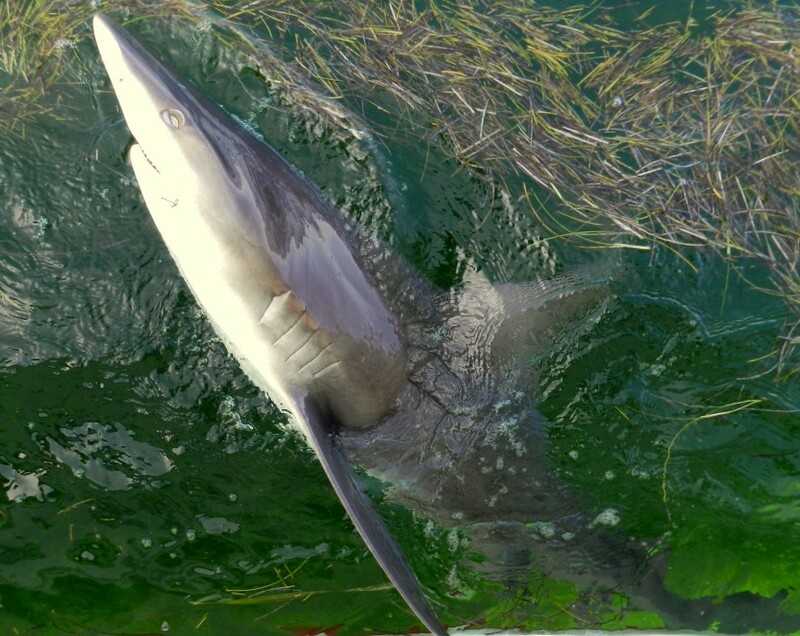 It all started when Paul lost a very sporty blacktip shark near 100 lbs as it charged the boat and cut the main line on the keel we even had to watch the balloon for some time as the shark stayed in the area. 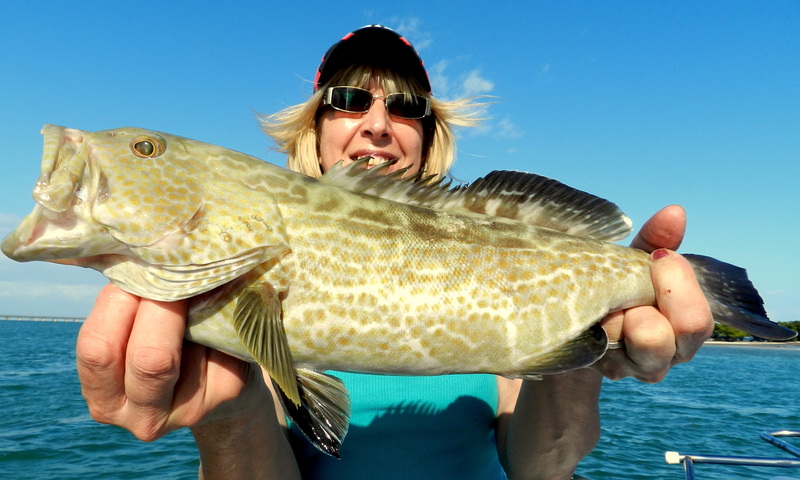 About two hours later Carol who as normal was having a blinding day on the lightest rod on the boat a 20 lb braid jigging rod was on a very big fish. After some time and in front of a good crowd watching the fish run and jump buy the old 7 mile bridge we could see her tiny jig had caught the broken line and she was fighting Paul’s lost shark. Well the shark must have known it was Carol on the other end and after a right royal fight and to the cheering of the crowd Carol had the fish to the boat, hook out trace back and high fives all round. 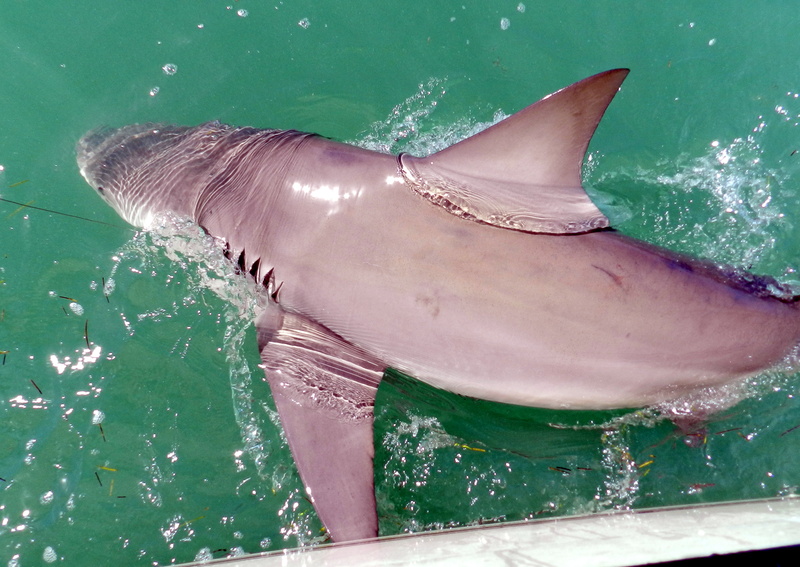 The photo of the over 300 lb bull shark just an other of Carol’s fish this week and taken just yards from the shore at Bahia Hond’s state park a stunning fish on a very winy day in the Keys. Video blog and I know its not fishing but it is a short walk round the B 17 that I still think their flight will be Paul and Carol’s flight high light of this trip. What does come as a shock is just how small this plane is and what conditions the 10 man crew had to go through on their many bombing missions during world war two. Had a look on Wiki and was amazed that of the 1.5 million metric tons of bombs dropped during the war the B17’s dropped over 600,000 tons and with out their help it could have been a very different story. Two very different stories this blog hope you enjoyed them both. Its fantastic to have people who just get how to have a Fishing Holiday in the Florida Keys I am lucky to have back again Paul and Carol who are one of those groups who do. No all important wish list, no it must be huge, no it must be perfect weather just great to be fishing and we catch what we catch. As I have said before when you loose the enjoyment of catching small fish you have lost a big part of fishing and when you try to hard the harder it becomes. 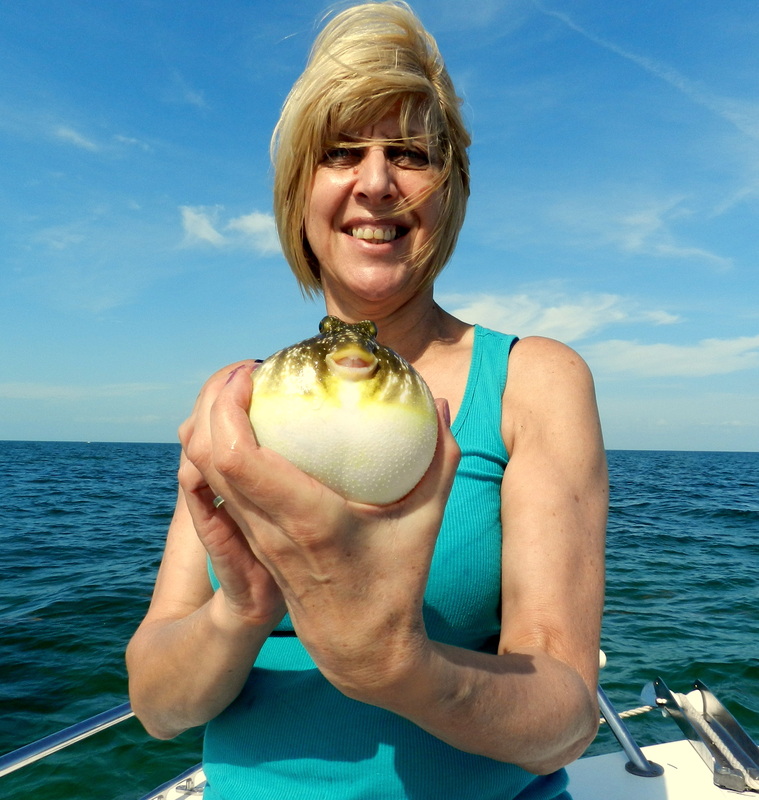 Just look at the photo of Carol with a puffer fish no long screaming runs just a cute fish of the Florida Keys and a big smile on Carol’s face. 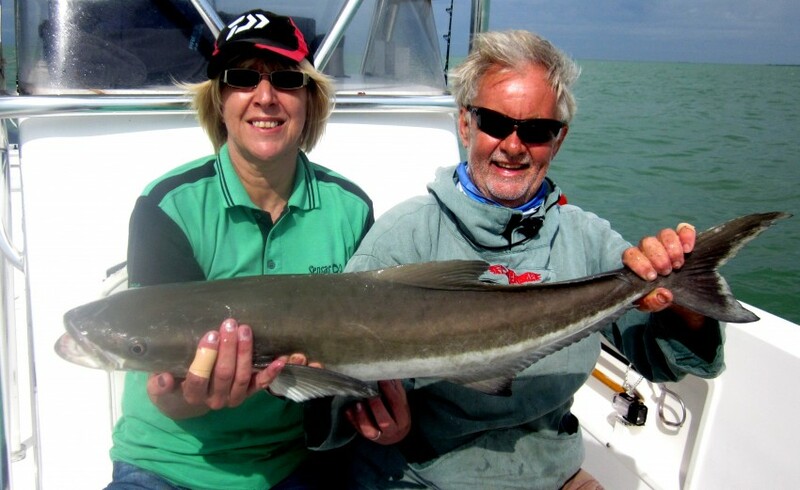 However as often happens with people who are not trying to hard that big fish come and Paul and Carol have only been fishing for two days but have had fish over 100 lbs each day. 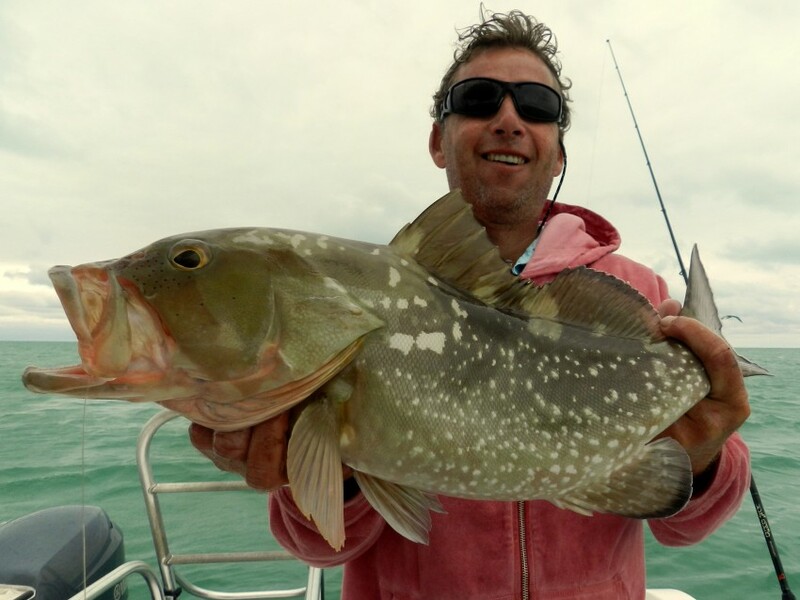 Even I have to say yesterday was not very nice at sea strong winds, big waves, cold ( well for the Keys low 70’s ) and wet rained most of the day but top marks for Paul and Carol who stuck it out till dark and had some fantastic fish. Grouper over 100 lbs, spinner, blacktip and lemon shark and top draw mackerel fishing poor Carol even getting spooled by a unstoppable fish on a 20 lb rod my guess a big king mackerel. 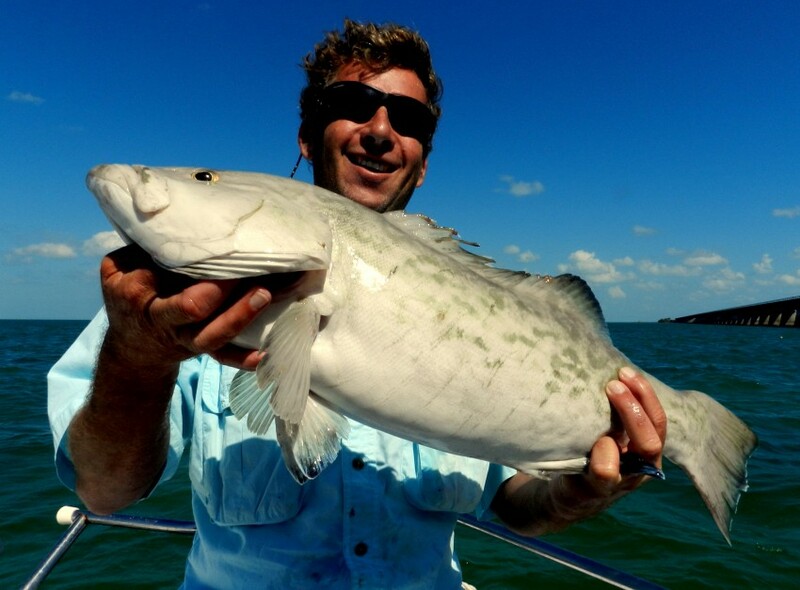 So we might have been the only boat out there but a great days fishing such is the joy of the Florida Keys. Most people on one of our holidays will take back the memory of a special fish or fishes but I know it is not this that Paul and Carol will take back this time but they both had a flight of a life time at our local airport. This week has seen an American historic flight group here offering flights in a second world war B 17 flying fortress and both Paul and Carol thought that this was such a rare chance they just had to go. What did blow them away once the plane was in the air the 10 passengers were free to move and could walk over the bomb bay sit in the gun turrets and go right behind the two pilots just awesome. What is even better the guys were more than happy for me to film the flight putting my Garmin Virb Elite on the tail watch the video and you will see people go right to the gun window to take photos. Just total respect to the young men some under 20 who flew these planes in combat just hard to get your head round what they did.